Even manufacturers of die-hard, professional military watches like Marathon and Stocker & Yale don’t do it: camouflage the dial of their watches. This is for good reason since legibility is key when entering a war zone. But like many divers watches that never see water apart from the occasional pool, many military inspired watches will similarly never see any combat. This gives watch brands the room to experiment with what might be impractical at war, but a lot of fun when enjoying life in freedom. 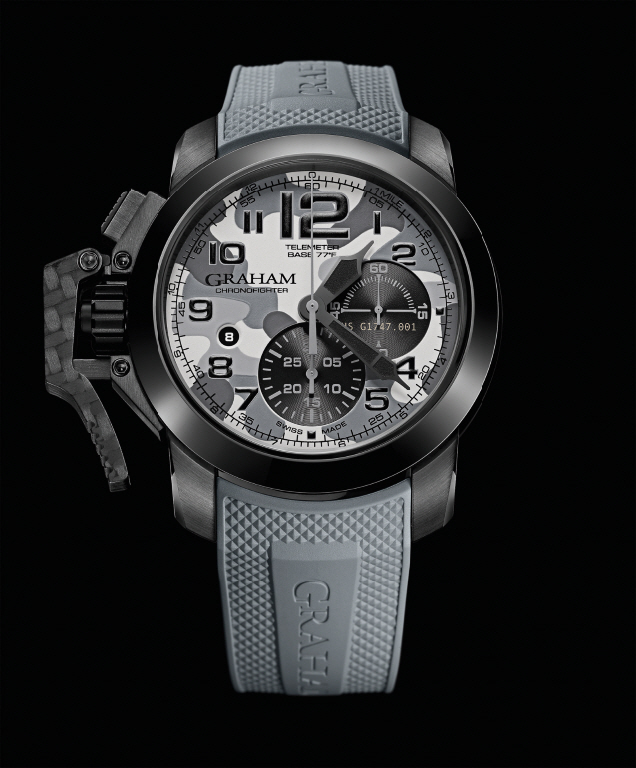 Graham most certainly has taken liberty with this idea with the introduction of not one, but three different watches, all doused in camouflage. A daring move by Graham, since a watch like this has to be done completely right otherwise you do run the risk of creating something of a joke. That being said, Graham does have a reputation of creating more uniquely styled watches, that are a lot of fun yet with a serious undertone. That is also exactly the case with the Chronofighter Oversize Black Arrow. The 47mm large case of the Chronofighter is PVD coated, and fitted with a black ceramic bezel, which gives it the sinister look of a member of the special forces staring at you in the dark. A nice detail is that the signature chronograph trigger is crafted from carbon fiber, to give the watch a high tech yet rugged look. 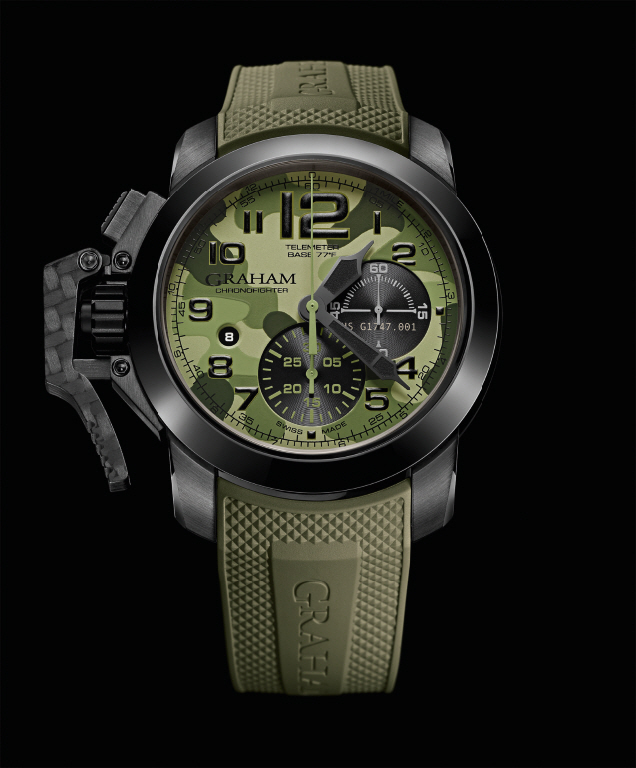 The Chronofighter Oversize Black Arrow is available with three different camouflage dials, for which Graham uses silkscreen printing to apply them; Jungle green, Mountain grey or Sand beige. Each color does give the Chronofighter Oversize a distinctly different look which is further amplified with a matching rubber strap. Although the comfort of a rubber strap is quite enjoyable, we would have loved to see this watch fitted with a rugged NATO-strap, just to take the watch one step further. 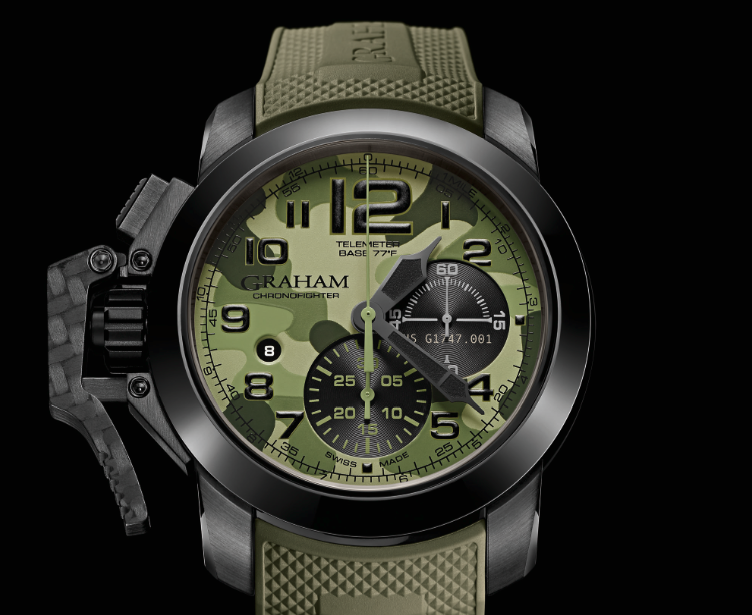 As said before, it is quite easy to make a watch featuring camouflage that looks like a joke, but this Graham has actually also quite a serious side to it. It’s dial is available with a telemeter scale in either miles or kilometers, where the first one is calibrated at 77 degrees Fahrenheit and the second one at 25 degrees Celsius. This might strike some as a surprise but the speed of sound is not always the same but depends on the temperature. Graham took the average temperature on earth and calibrated its telemeter scale based on this. Most owners will probably use this to measure how far a thunder storm is away, but as a matter of fact it can also be used to determine how far away an explosion is taking place. Of course the Chronofighter Oversize Black Arrow was intended for active military duty about as much as The Expendables are an active military unit, but fun it is! That being said; the watch might be a nice choice for when they start filming Expendables IV.